Eddy current testing is a frequently used NDT method at Saab/CSM but up to now only single frequency testing has been used. Through the participation of Saab/CSM in a Brite-Euram project, "CANDIA", it has been possible for us to learn about multi-frequency testing and also to combine it with a flexible scanner, developed in a preceding Brite-Euram project. The purpose of our work was to increase both testing speed and sensitivity by using multi-frequency eddy current testing combined with a scanning system for corrosion detection in multi-layered structures. The wing of the Saab 2000 aircraft was one specific example for which several samples were manufactured with both artificial (chemically etched) corrosion of various severity and cracks. After optimising single frequencies multi frequency testing was approached. Using the previously determined optimal single frequency as a start, frequency combinations were determined to give increased detectability for the different structures and defects. The influence of different disturbing signals e.g. signals from fasteners, thickness variations, noise, and how to reduce them using the multi frequency technique was studied. A scanner was adapted to make it compatible with the eddy current instrument resulting in a complete scanning system. During the project tests have also been made in "fieldable" conditions to evaluate the system. In connection to that components with real corrosion have also been tested with promising results. The possibility to produce C-scans from the mixed multi-frequency signals was very fruitful. The goals to increase testing speed and sensitivity have been reached. The combination of an advanced multi-frequency instrument with a scanning system will give possibilities for inspections with an increased speed and better results than earlier could be achieved at Saab and CSM which will increase the use of eddy current inspections. The wing structure of the Saab 2000 aircraft consists of multilayered adhesive bonded aluminium. When the aircrafts are ageing there is a need to be able to inspect the structure for cracks and corrosion. A suitable NDT method for this inspection is eddy current testing. For testing of thick, multilayered, structures several problems will be faced which will reduce the possibilities to detect defects. For example there will be disturbing signals (from coatings or adhesive layers e.g.). To penetrate the entire thickness only low frequencies can be used. Defects can often be suspected at different depths, depending on the number of aluminium sheets. This creates a demand to be able to inspect over a wide thickness interval. To achieve this the same area may have to be inspected several times using different frequencies which will make testing very time consuming. Multi-frequency eddy current testing provides a possibility to enhance detectability of defects by surpressing unwanted signals. This is achieved by mixing of signals from several frequencies. It can also be used to increase testing speed by simultaneously using frequencies optimised for inspections at different interesting depths. The purpose of this work was to increase testing speed and at the same time increase defect detectability for inspections of multilayered adhesive bonded aluminium structures. The defects that were to be detected were hidden corrosion, either between aluminium layers or at the back of the innermost skin. When determining a suitable frequency band for testing at a certain depth this can be done simply by using the equation for standard penetration depth which theoretically will give a depth where the current density is is reduced to 37% compared to at the surface of the tested material. For testing in real conditions a number of parameters will affect the eddy current signal and create an "effective" penetration depth, e.g. : probe characteristics, noise, structure, defect type. It is quite obvious that probe characteristics will affect the penetration depth. Noise can originate from the instrument, surrounding electric fields, variations in the electromagnetic properties of the tested material, surface roughness etc. Influences from the structure can for the multilayered structure be i.e. adhesive bonds and possibly air gaps between aluminium sheets. Different defect types will require that different amounts of the total field have to be affected in order to be able to detect the defects. To be able to estimate suitable single frequency bands a set of aluminium sheets with varying thicknesses was produced. In one of these sheets a strip was chemically etched to simulate corrosion. These sheets were stacked to simulate a multilayered structure with corrosion in the bottom layer. For different thicknesses the optimal frequency was experimentally determined for different probes. The criterion to select the optimal frequency was the amplitude of signal from the simulated corrosion. Fig 1: Optimal frequencies (left graph) and corresponding signal amplitudes (right graph) for corrosion detection. Green squares represent HNDT 5P309; blue squares represent PKAV 64-3; red triangles represent standard penetration depth. For two frequently used probes the results are shown in fig. 1. It is obvious that the two probes behave differently. The probe represented by the blue squares is Rohmann PKAV 64-3, a sliding probe with one receiving and one transmitting coil. The probe represented by the green squares is HNDT 5P309, a spring loaded absolute probe. The red triangles in fig. 1 represent the theoretically calculated standard penetration depth. From these graphes it can be seen that this simulated corrosion will be detected at higher frequencies than according to the standard penetration depth except for corrosion lying very close to the surface. To optimise testing frequncies have to be determined individually for the used probe, the standard penetration depth shall only be used as a very rough guide. The right picture presents the amplitudes for the probes at the same frequencies as in the left picture. It can be seen that a higher amplitude is obtained with the PKAV probe than with the HNDT. This shows that the PKAV probe can be used for larger depths than the HNDT. Based on the observed noise level during this test, the HNDT probe should not be used for greater depths than approximately 2.5mm. This figure will however depend on the inspection conditions which will affect the noise level. variations in thickness of the aluminium sheets. Lift-off and thickness variations of coatings will give equally oriented signals (as long as the coating is non-conductive). Fasteners can be made of a different material than the inspected structure. The geometry of them will also affect. Detection of cracks shorter than the extension of the head of the fastener is complicated for this reason. The presence of adhesive films is not a problem in itself, but the spacing between sheets that will result from them may create disturbances, especially if the spacing varies. In the previous section some disturbances were mentioned. Single frequency testing will give very small possibilities to reduce the influence of them. Phase rotations, different amplifications in different directions and lowpass- bandpass- and highpass filtering are the means available. Using more than one frequency simultaneously gives possibilities to reduce one or more disturbing parameter. The fundamentals of multi frequency eddy current testing are well described in the litterature, see e.g . In  especially the influence of a variable gap between sheets on the eddy current signal has been investigated. Before performing mixing of signals the demands on the mixing have ot be considered. Traditionally a certain signal has to be reduced, e.g. a supporting plate in a tube. In this project we have been working with a scanning system. The C-scan image presented will only show the signals along one axis of the impedance plane. Thus, for scanning purposes, phase separation of wanted / unwanted signals will also be an important task of the mixing of frequencies. The scanning system used for this work was developed by CSM Materialteknik in a previous Brite-Euram project, BE-5879. The scanning device is a motorised version of the SM-100 Scan Master Flexitrack from IRT. The motor drive and data aquisition units are manufactured by Meccasonics Ltd. The system is very versatile since the scanner can be mounted on almost any surface, including heaviliy curved ones, and is equipped with a probeholder that can be used for various probes and also for different NDT methods. 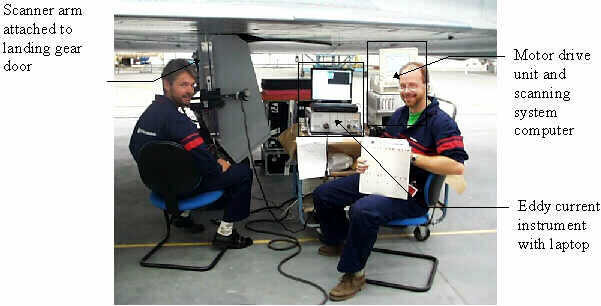 Fig 2: Picture of the scanning system with multi frequency eddy current instrument. Some modifications had to be done to the scanning system before it could be used with the RD Tech TC 5700 instrument, which was used in this project, since the scanning system needs an analog voltage from the NDT equipment and the instrument does not have that. Positioning signals were taken from the scanner motor drive unit and fed into the C-scan software of the eddy current instrument. Fig. 2 shows the scanning system mounted on a landing gear door. In this section some examples will be shown and discussed where multi frequency testing has been used to improve inspection capabilities. For the examples shown the RD Tech TC5700 was used. This instrument showed to be very well suited to perform very accurate mixing of signals with i high degree of control for the operator. The C-scan images show the horisontal direction of the impedance plane. A cover on an airplane had to be inspected. The cover was made of 1 mm thick aluminium with increased thicknes in certain areas where fasteners were attached. When testing with one frequency an interesting area was discovered on the C-scan (see left part of fig 3). The location of it made it reasonable to assume that there could be corrosion on the inside of the cover. It was also noticed that the painted surface of the cover was slightly bulging. To investigate this further a scan using two mixed frequencies was performed. The frequencies were mixed to reduce the lift-off signal. The result is shown in the right part of fig 3. In this C-scan there are no indications of defects. In fig 3 the impedance planes of the horisontal line of the cursors in the C-scans are also shown. The signal in the interesting area observed at single frequency testing has been drastically reduced in the multi frequency scan. From this we concluded that it was the lift-off signal caused by the bulginess of the surface that was observed in the single frequency scan. Fig 3: Scans of a part of a cover. Single frequency scan to the left, two frequency scan to the right. The impedance planes represent the horisontal line of the cursor. This approach should also be useful when the surface is rough or where there is a coating present with varying thickness which will cause the distance between probe and metal to vary. For this test a sample representing the wing of the Saab 2000 similar to the one shown in fig 5 but with two skins and a spar was used. It was observed that the signals from the single frequencies, 3 kHz and 7 kHz, were very noisy. These are shown in fig 4, left and middle picture. After mixing (to reduce fastener signals) most of the noise had dissapeared, see fig 4, right picture. Fig 4: Impedance planes of test on multilayered structure similar to fig 5. 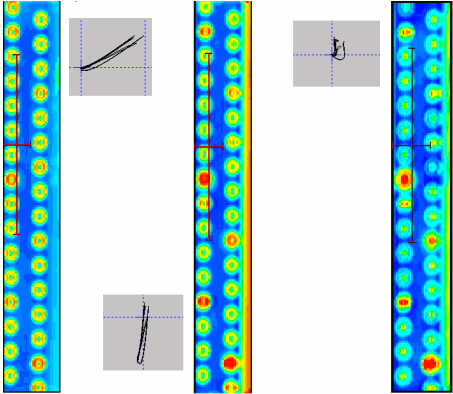 Left picture shows testing at 3 kHz, middle picture shows testing at 7 kHz and right picure shows a mix of 3 and 7 kHz, mixed to reduce the influence of fasteners. The crack signal is clearly distiguishable from the corrosion signal both of them being much larger than the noise. The phase angle between the signals from cracks and corrosions is close to 90° , which means that either one of them can be almost totally reduced in a C-scan to fascilitate interpretation. Since the mixing consists of an adding operation of the signals from the two frequencies it is of course possible to mix in a way that noise signals cancel each other though it generally is believed that multi frequency testing will increase the noise level. A sample representing the wing structure of the Saab 2000 aircraft was tested. The sample contained a number of defects, both simulated corrosion and artificial cracks. The sample is shown in fig 5. Fig 5: Sketch of sample representing wing of Saab 2000. The sample contains cracks in the spar cap and corrosion at the bond between skin and spar cap. Sk=corrosion in skin, Sp= corrosion in spar cap. Extension of corrosion: "small" 2 mm from rivet head, "medium" 4 mm from rivet head, "large" 6 mm from rivet head. Cracks extend 2 mm, 4 mm and 6 mm from rivet head. Several sources of disturbances exist in this inspection situation. The rivets are made of titanium which has a different conductivity compared to aluminium, there is corrosion in both skin and spar cap, cracks and corrosion are present simultaneously. For testing of this sample the Rohmann PKAV 64-3 probe was used. In fig 6 C-scans from this sample are shown. Fig 6: C-scans of sample showed in fig 5. Left scan is made using 3 kHz, middle scan with 3 kHz mixed with 7 kHz to influence of fasteners. For the right scan 3 kHz was mixed with 7 kHz to achieve a 90° angle between corrosion and cracks. The resulting signal was mixed with 7 kHz once more to reduce influence of fasteners. Initially a previously determined single frequency was used, according to fig 1. The chosen frequency was 3 kHz. The single frequency scan is shown on the left in fig 6. At this frequency the signals from cracks and corrosion are approximately perpendicular. The signal has been phase rotated to minimise the signal from the cracks in the C-scan. Most of the corroded areas can be identified. Nothing can however be said regarding the depth of the corrosion. For the middle scan in fig 6 3 kHz was mixed with 7 kHz. The purpose was to reduce the signals from the rivets. Phase rotation was performed to minimise the signals from the cracks in the C-scan. The detectability for corrosion has increased compared to the single frequency scan. All corroded areas can (vaguely) be detected. The signals from the cracks have increased in the C-scan which confuses interpretation of the results. It can also be seen that the reduction of the rivet signals has hardly succeeded at all. For the scan on the right in fig 6 3kHz was mixed with 7 kHz. The purpose was to achieve a 90° angle between the corrosion signal and crack signal. This mixed signal was mixed another time with 7 kHz, this time to reduce the signal from the rivets. Again the resulting signal was phase rotated to reduce the crack signal in the C-scan. In this case it is clear that the rivet signals were substantially reduced. All corroded areas can be identified and it is also possible to rank which areas are most severly corroded (unfortunately the image quality when reproduced on paper is much worse than on the screen and will probably not allow these differences to be visualised). In fig 6 impedance plane representations are shown for the vertical line of the cursors in the C-scans. It is clear that the amplitude of the corrosion signal is large, even for single frequency testing. The cause for the corroded spots not to be clearly detected is because the rivet signal is almost of equal amplitude and phase. In the scan to the right the total signal amplitude has decreased, but the difference in signal between fastener and corrosion are larger in the horisontal direction which is pressneted in the C-scans. In this test no attempts have been made to distinguish between corrosion in the top sheet and in the spar. The initially set goals regarding increased inspection speed and detectability have been reached. The adaption of the scanning system was successful which has resulted in a mobile, very versatile scanning system. A lot of knowledge has been gained especially on different, naturally occuring factors which will disturb the eddy current signals and how to reduce them by using a multi frequency technique. Future work should involve further investigations on how to use more than two frequencies to reach increased defect detectability and recognition between disturbances and the interesting part of the eddy current signal. From a hardware point of view the size of the scanning system (as it is shown in fig 2) should be reduced to increase the mobility. Nondestructive Testing Handbook, Volume 4, Editor P McIntire, ASNT. J Thompson, Subsurface Corrosion Detection in Aircraft Lap Splices Using a Dual Frequency Eddy Current Inspection Technique, Materials Evaluation, December 1993.